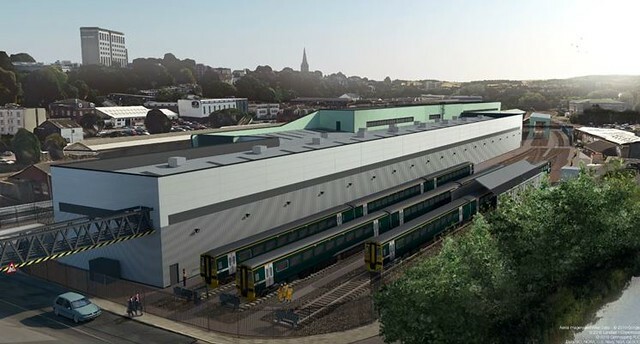 Image of extended Exeter Depot that is under construction. I thought I would try an image relevant to the Devon Metro. Passed through Exeter yesterday and they are still levelling the site. Image is looking from the NW. Level crossing to left out of image. Is there any mileage in persuading Exeter Chiefs to part-fund a loop/turn-back between Digby and Sowton and Newcourt? The idea has been kicked into touch. They could at least try. Surely not too big a job to tackle. The proposed Riviera stadium and music events centre at Nightingale Park (ex refuse tip) is up for planning permission soon. This is within 200yds of the proposed Kingskerswell Station (I would call it Riviera Way (Torquay)) and the developers said they would make a contribution. 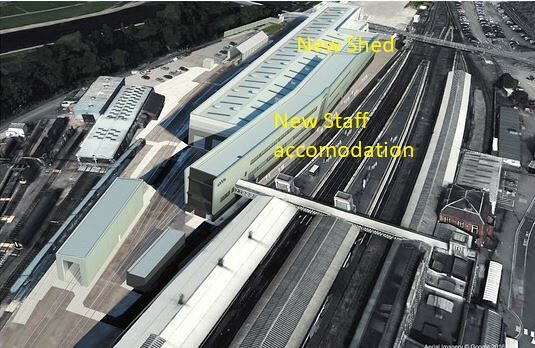 This might make it happen yet the cost seem to be spiralling out of control for two platforms and some ramps just as Marsh Barton's cost have. I think the problem with having the turn-back / loop *between Digby & Sowton and Newcourt* is that it doesn't help to solve the capacity constraint on the single line between Topsham and Exmouth Junction. The problem with having the loop _at_ Digby is that there is no room - the platform takes up the space of the lifted 2nd track. The problem with having the loop _south_ of Digby is that it is too close to the existing loop at Topsham and so doesn't help with capacity. The current service is 2 trains per hour (tph) in each direction on the single line. This makes full use of the exisiting capacity because it takes trains ~ 13 minutes to go from Topsham to Exmouth Junction (and it will take slightly longer if the proposed station at Monkerton between Digby and Polsloe Bridge gets built). The only way to run more trains on this section is to have a loop, but to maintain regular services it must, by symmetry, be somewhere that is ~7 minutes north of Topsham. so the new loop really has to be north of Digby, between Digby and the proposed station site at Monkerton. Of course it would be even better for timetable resilience to re-double all the way to Exmouth Junction, but this would cost more, not least because Polsloe Bridge and Monkerton would then need two platforms rather than one. (1) Install a loop between Digby and the proposed station site at Monkerton, and upgrade the signalling so that the line in one of the platforms at Topsham is reversible. This allows a 4 tph service to Tophsam. Alternate southbound trains would continue to Exmouth as currently, while the others would turn-back at Topsham. Thus Digby could have 4tph to Exeter, 4tph to Topsham and 2tph to Exmouth. This requires upgraded signalling, some pointwork and a short section of new loop line. 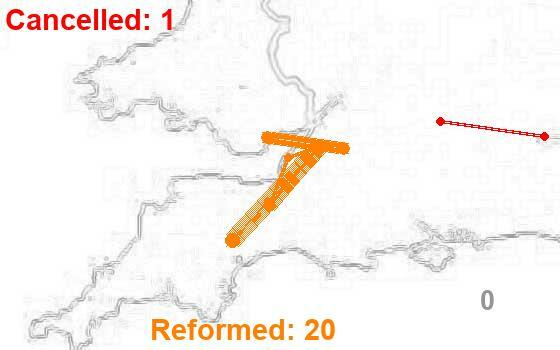 (1a) (optional) beef up timetable resilience by re-doubling all the way from the new loop in (1) to Exmouth Junction. Amongst other things, this has the advantage of preventing southbound trains at Exmouth Junction from blocking the Up Waterloo line while they await access to the branch. It would, however, require station upgrades as well as new track and an upgrade of Exmouth Junction. (2) (possibly later) Install a loop at Lympstone Village so that all 4 tph to Topsham from stage (1) can run to Exmouth. Newton Abbott to Paignton closed until 1600, 11 November for some track laying. Cannot be much. Very slow progress at Exeter Depot with only the steelwork for one shed. No news of the Devon Metro start unless an expert here knows different..